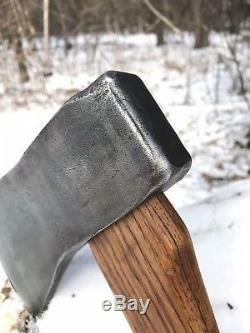 Beautiful and fully restored And Rare 3.2lb Norlund Cabin Axe. 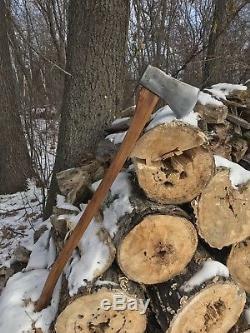 This particular axe has beveled pole edges which hasnt been seen on other cabin axes by Norlund axe collectors and experts Ive asked therefore could be one if a kind. Its been hung on a new 36 hickory haft thats been burned and wedges with Hackberry. Not just a wall hanger! You can use this one! 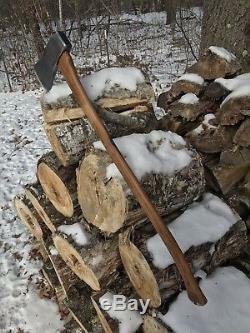 This axe has been tested by me for durability! Its ready to cut or hang on the wall. I Burn my handles, and this one turned out amazing! Burned handles have been around for a very longtime, its not just for looks! Flame Seasoned is another term for it which means the handle is tempered by a process known to the Indians before the white man came to America. 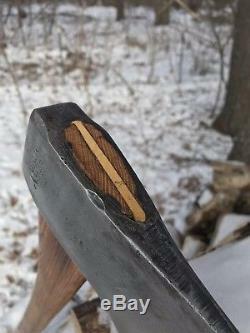 I take care to apply a nice even burn over the entire handle prior to fitting the axe head the final time. This ash handle has been treated with multiple coats of Boiled Linseed Oil. I use a professional bench mounted belt sander for sharpening. If its a single bit Ill put a convex cutting edge on it, if its a double bit Ill put a convex cutting edge on one bit and a more durable edge on the other for debarking or working close to the ground or splitting. I start by putting a fresh edge on the bit if it needs it using 80 grit to get rid of any imperfections in the shape of the bit. I follow the original shape of the bit as closely as possible. Then I put the first part of the convex edge on the bit using 180, 220 or 320 grit depending on the hardness of the bit, then I switch to the second part of the convex shape. Once Im satisfied with the shape of the edge and have established a wire its on to the 600 or 800 and finally 1000 grit to a wire edge, then I remove the wire with a leather strop. The strop with jewelers rouge for cutting gives the axe bit a mirror like finished edge that is slick and smooth. For some heads Ill then polish the edge on a buffer and then finely re-sharpen it on the strop. Believe it or not the polishing wheel can dull the bit just slightly. 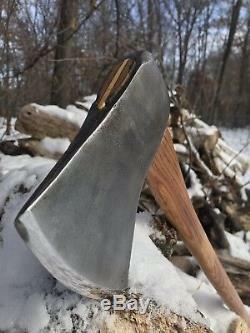 For those concerned with a belt sander ruining the temper of the bit, I hold the head with my bare hands while sharpening so I know when it gets warm so I never over heat the axe head. When Im done the axe will shave hair off your arm! I mean its razor sharp! Please be careful when you receive it! 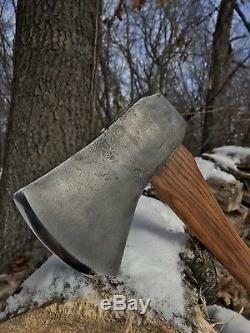 I do my best to take detailed pictures and the pics are a big part of the description, I don't hide anything so I'll always let you know if there's something wonky about the axe. 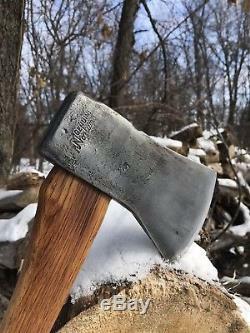 Key search words: Gransfors Bruks, Hults Bruks, Hultafors, True Temper, Kelly, Black Raven, Double Bit, Sager, Arvika, Sweden, High Carbon, Hand Made, Forged, Throwing Axe, Wetterlings, Marshall Wells, Artisan, Vintage Axe, Barn Find, Wall Hanger, Cruiser, Made in Sweden, Axe head, Axe, Haft, Doubel Bit, Single Bit, Marshall Wells, True Temper, Kelly Works, Zenith. 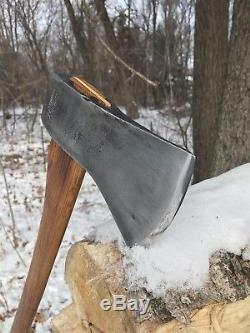 The item "Restored Norlund Cabin Axe. Very Rare beveled Pole May Be One Of A Kind. 36" is in sale since Thursday, December 27, 2018. This item is in the category "Collectibles\Tools, Hardware & Locks\Tools\Carpentry, Woodworking\Axes, Hatchets". The seller is "vintageaxerevival" and is located in Cedar, Minnesota. This item can be shipped to United States.